Spoonflower Sale! - Jill Ruth & Co.
Last year at this time, Spoonflower had a buy one, get one free of their fat quarters and I jumped on it. This year they are doing the same thing this week and I wanted to let you in on it! 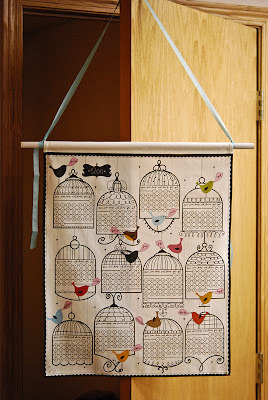 I bought some tea towel calendars for gifts and my favorites from last year have been updated for 2012! This birdie one is so cute! After I took the picture I cut off the excess dowel rod and fixed the ribbon. :) I was in a hurry for some reason to take the picture. The 2012 calender can be purchased here. I didn't take a picture of the one I gave my oldest daughter, but you can view it here on flickr. After hemming it and adding the rod pocket I embroidered a circle around her and her husband's wedding date. Get it?! It's a bicycle built for two!! Do you know anyone getting married this year? It's a great gift! The designer (beck&lundy) has updated the calendar and you can purchase it here (choice of two different colors). For you tea drinkers: this one! Spoonflower recommends the linen cotton canvas for the tea towels and that is what I bought. At BOGO, that's only $7 a piece. Another favorite of mine...what about a tote bag out of it? I've blogged about Spoonflower before...wouldn't it be great to design your own fabric? !...on my to do list! Link for all tea towels. Remember the sale is for all fat quarters, not just tea towels. I'd love to know if you decide to order any and how you used it! I love the tea cup towel. Such a great idea! first of all I adore your festive blog header dear Jill! how exciting and wonderful about your expected grandchild!! !